I'm delighted to announce the launch of Europe's first large scale leadership summit on the Platform Economy, taking place in Berlin on 20-22 November. The event is kindly supported by the World Economic Forum and MIT's Initiative on the Digital Economy, and sponsored by Deutsche Bank, SAP and Accenture. 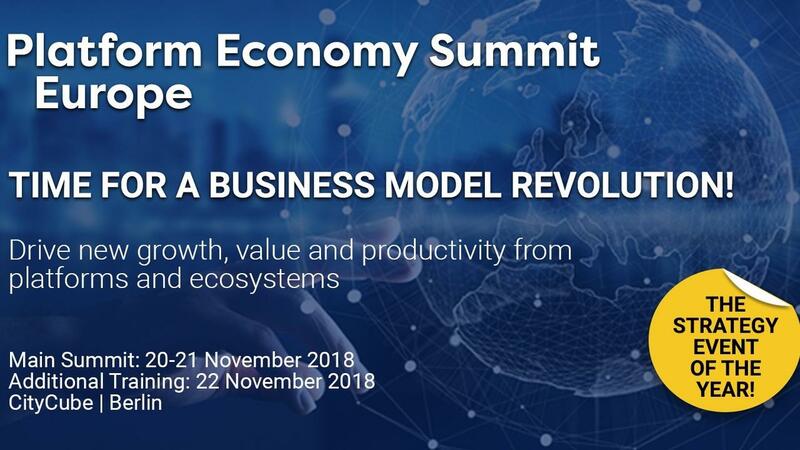 300+ CxOs from across multiple sectors will be gathering together with the world's leading experts on platforms, ecosystems and business model transformation to share new insights, case studies and roadmaps for how to stimulate new growth, value and productivity for European business and society. A fantastic line up of speakers from across the world. Details here. My role is overall Executive Producer. I'll also be moderating quite a lot of the event, and co-facilitating a special deep-dive training 'masterclass' on the 22 Nov.